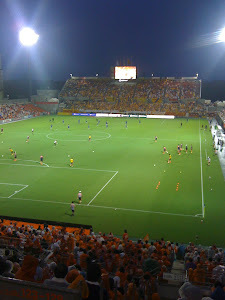 The photograph which I am currently using on this blog was taken last season at the Nack 5 stadium before the 2-2 draw with Vegalta Sendai. It's taken from the seating area in the home end behind the goal. It was a very exciting game despite the weather. It rained fairly heavily at the start of the game, and although the temperature was fairly warm, it did rain later on too. By the time the rain had gone so had the chance of all 3 points for the Squirrels as they collapsed to a stirring comeback from Vegalta, who were 2 nil down at one point. Nevertheless, even as an Ardija fan, I would have to say that Vegalta were playing the better football and keeping position reasonably well while 2 nil down. Safe to say, on the performances of the teams, Sendai here got what they deserved, and perhaps they even deserved a bit more. I went home, knowing I'd been lucky to see a good game, but very disappointed that Ardija had not been able to hold on to all 3 points and claim a rare home win.